Objectives The short term outcomes of laparoscopic adrenalectomy are well known. 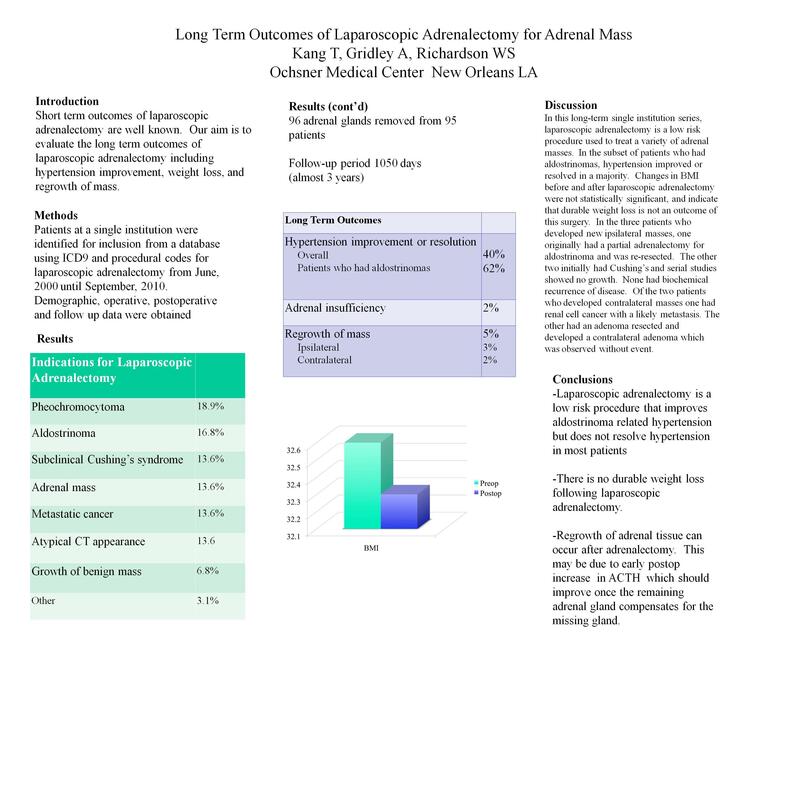 Our aim was to evaluate the long term outcomes of laparoscopic adrenalectomy. Methods Patients were identified for inclusion from a database using ICD9 and procedural codes for laparoscopic adrenalectomy from June, 2000 until September, 2010. Demographic, operative, postoperative and follow up data were obtained. Results 96 adrenal glands were removed from 95 patients. 18.9% were pheochromocytomas, 16.8% were aldostrinomas, 13.6% each were removed for either adrenal mass, subclinical cushing’s syndrome, atypical appearance on CT or metastatic cancer, 6.8% were removed for growth on follow up CT (all had benign pathology) and 3.1% were removed for other reasons. Length of follow up was 1050±1019 days (almost three years). Two patients developed adrenal insufficiency (Cushing’s and Pheo). 36 patients had postoperative abdominal CT, MRI or PET studies and three patients developed new ispilateral nodules. One was originally a partial adrenalectomy for an aldostrinoma and was re-resected and two initially had resections for Cushing’s and were observed and follow up studies showed no growth. None had chemical recurrence of disease. 2 patients developed contralateral masses. One with renal cell cancer had a likely metastasis and one had an adenoma resected had CT showing likely adenoma which was observed. Mean BMI was 32.6 and at last follow up 32.3. There was no significant change in weight with any disease. 65 patients had hypertension which improved or resolved in 40% of all patients and 62% of patients who had aldosteronomas. Conclusions Regrowth of adrenal tissue can occur after adrenalectomy possibly due to increased ACTH and is likely to be inconsequential. Patient weight does not alter after adrenalecomy for Cushing disease. Laparoscopic adrenalectomy is a low risk procedure that improves adrenal related hypertension and thus possible complications due to adrenal related hypertension but does not resolve hypertension in most patients.